The April board meeting will be held Tuesday night April 16, 2019 @ 7:00 pm in the conference room. Items on the agenda include: building update, certification of election results, disband and reorganization of the board, support staff salaries, health insurance, custodial bids, and executive session. MAP and EOC testing is scheduled to begin next week on Tuesday the 16th. Testing will occur over the next three weeks in both the morning and afternoon. It is really important for students to get to school on time, have a good night of rest, and eat breakfast. 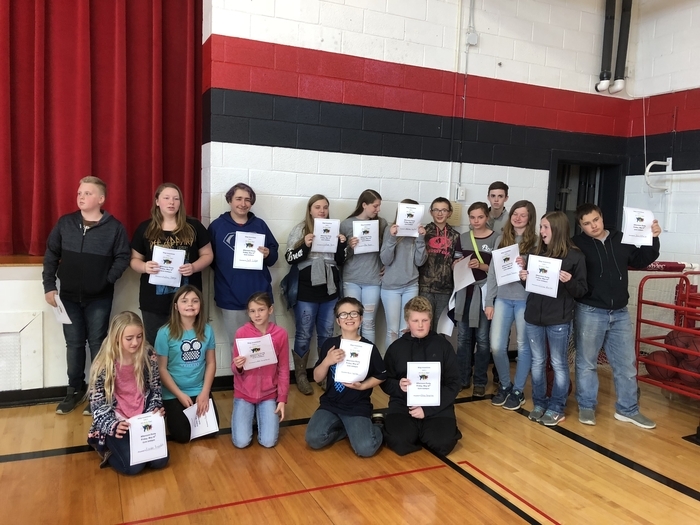 Reminder for those students in 1st-8th Grade participating in the Academic Bee this Friday, April 5th at Leeton School. Students will stay after school and ride the bus to Leeton. The Bee begins at 4:30 p.m. Parents are welcome to attend. Please contact Mrs. Dillon with any questions. The Winter Sport Athletic Banquet is Thursday, March 28th at 6:30 this is for Lady Indians Basketball and Varsity Basketball and Basketball Cheerleaders. 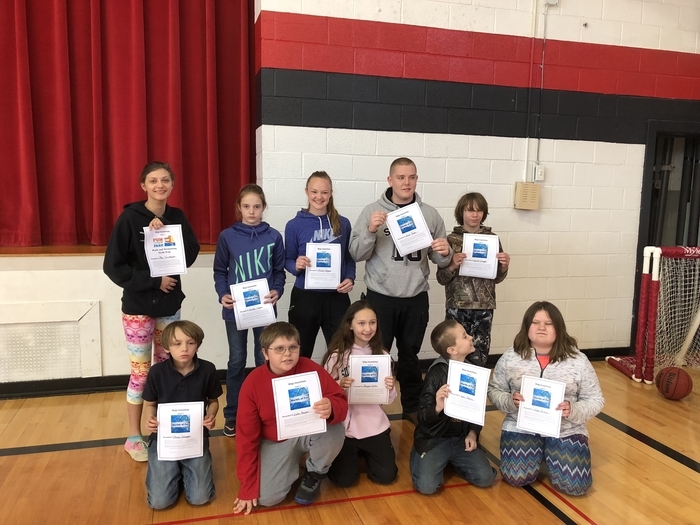 The 9 students attending the STEAM Event at UCM tomorrow March 25th need to be at the school by 7:15 a.m.
March Board Meeting will be held Monday 3/18 at 7:00 pm in the conference room. Items on the agenda include: Building update, 19-20 School Calendar (the calendar proposed has a start date earlier than 10 days prior to the 1st Monday in September), Certified Salary schedule, Certified Salaries, Setting the Date for Board Reorganization, and Information on Health Insurance. Executive session will be held after the regular meeting based on RSMo 610.021; (1), (2), (3), & (6). Reminder tomorrow Wednesday March 13th is a early dismissal. Thursday March 7th is Family Literacy Night from 5:30-7 PM please come join the 5th & 6th graders learn about the experiments with their plants. Saturday, February 23rd, PTO is having a Glow Dance for kids K-6 from 6-8 PM in the school gym. Cost is $3 for individual and $5 for couples. Wear your brightest clothes and have some fun dancing with your friends. Monday February 25th 3:15-4:45 PM is track & field practice for anyone 7th-12th grade. Physical is required to participate, speak to coach Dolph or coach Cawelti if you do not have a physical. The regularly scheduled Board of Education meeting will be held tonight in room 101 of the school. Items on the agenda include: old business of building update and the March board meeting date, New business is review the 19-20 school calendar, set the committee for the Wilma Hill Scholarship, budget update and preliminary FY20 summary, New job description, security system approval, New financial software. Executive session will be held for legal update and personnel reasons. Tomorrow's district game vs. Leeton now starts at 5:15pm in LaMonte. Again, CHS Boy's vs. Leeton at 5:15pm at LaMonte High School. Bus will now depart at 3:45pm. Please stay tuned. Tomorrow's first round game vs. Leeton may be adjusted from a 4pm tip-off. We will keep you posted. Due to forecasted weather, tomorrow's boy's district game has been rescheduled for 4pm in LaMonte. Again, the CHS Boy's first round game versus Leeton is now scheduled for tomorrow (Tuesday) in LaMonte at 4pm. The bus will depart at 2:30pm. Tonight's District basketball game in Green Ridge has been rescheduled. The Lady Indians will now play Sunday at 4pm. 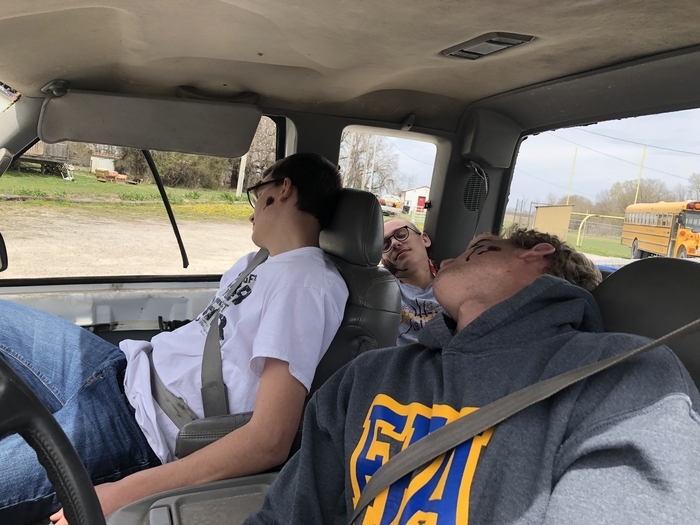 The school van will depart at 2:30pm. Practices will be cancelled today, Friday, Feb. 15th. District Playoffs in Green Ridge begin this weekend. The Lady Indian's opening round game versus Calhoun is scheduled for Saturday, Feb. 16th at 6pm. The Boy's open the playoffs versus Leeton on Tuesday, Feb. 19th. Please join us this evening at 5:30 to honor our seniors who participate in basketball and cheer. The Lady Indians start the night at 5:30pm with the Boy's to follow. We will honor our seniors between games. Due to Miami not having enough players, there will be no JV tonight. Due to conditions in Ballard, tonight's basketball game has been cancelled. With districts starting next week, we will not be rescheduling this game, nor the Leeton game. Tonight the boy's will practice from 3:30-4:30 and the girl's will practice from 5:00-6:30. This message is to confirm that the Indians Boy's Basketball team will play for third place at Appleton City at 5pm tonight. On Monday the Indians Boy's Basketball team will be traveling to Ballard to play the Bulldogs. The Lady Indians will now also be playing at Ballard on Monday. The bus will depart the school at 3:15pm. Girls play at 6pm with varsity boys to follow. Tomorrow's Boy's 3rd place make-up game at Appleton City is still on as scheduled until further notice. Tonight's basketball game versus Leeton has been cancelled. Due to continuing poor road conditions school will not be in session Thursday 2/7. 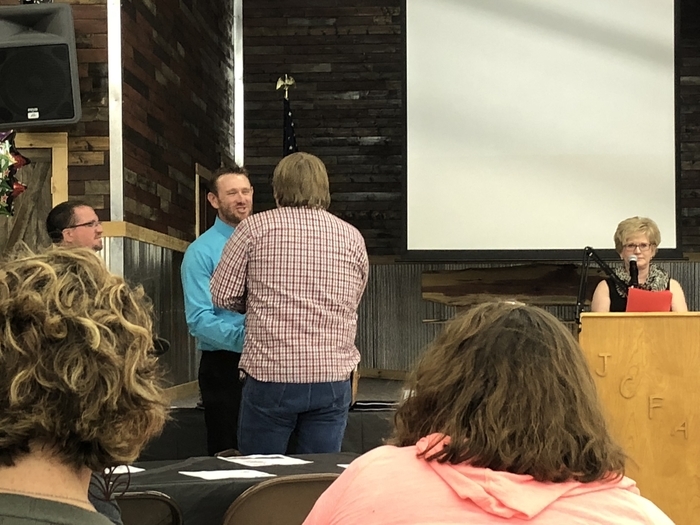 The Chilhowee School District would like to THANK Travis and Lindsay Weigand. As part of their wedding ceremony they asked that in place of gifts, donations be made to the school. 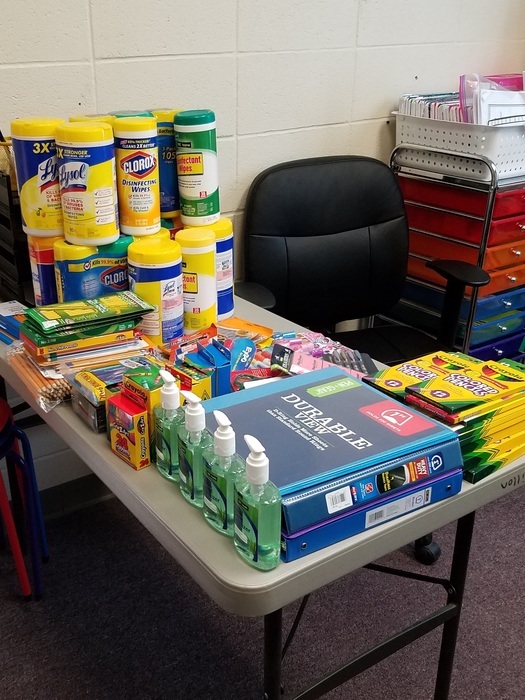 The school received lots of supplies as well as cash donations for student needs! 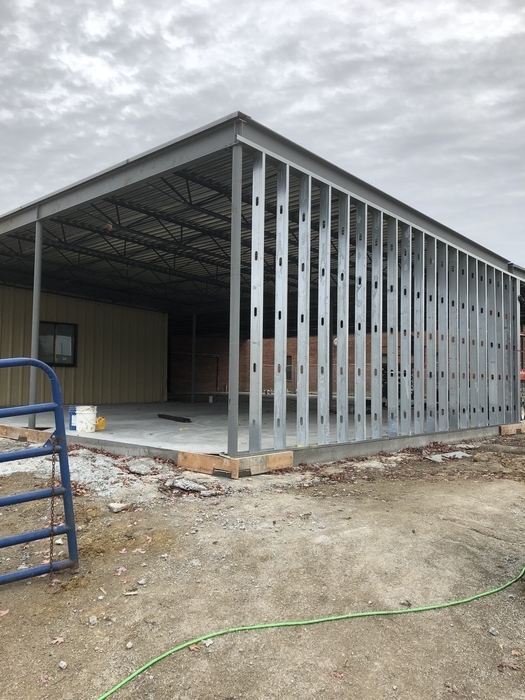 Building is progressing, doors are installed, lights are on! and ceiling tiles being installed. Tonight is a home game against Heartland with Lady Indians tipping off at 5:30 PM followed by the Varsity boys. With the forecast cold temperatures the next few mornings, please keep the kids inside until the buses arrive and bundle them up. The game at Norborne has been rescheduled for Monday, January 28th at 5:30. Bus will depart at 3:15, with 2 quarters of boys JV, varsity girls and varsity boys following. 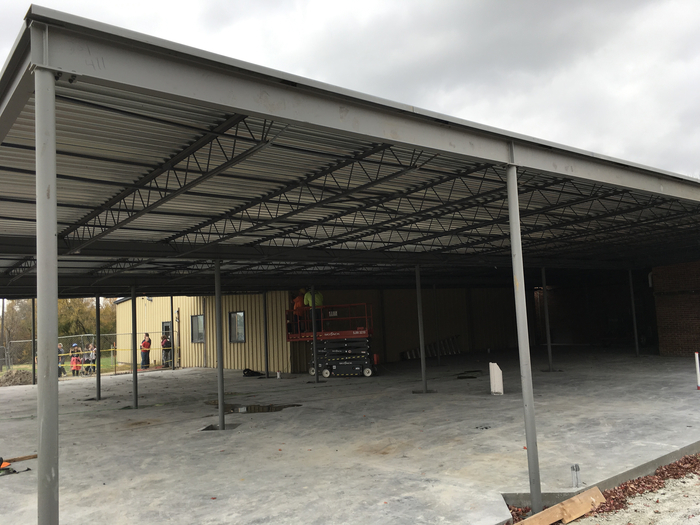 The metal siding is completed and the roof flashing is being added. Tonight basketball game at Norborne has been cancelled due to weather we will let everyone know when this game get rescheduled. 3-12 Science Club is cancelled for tomorrow January 17th due to possible weather. The Board of Education meeting will be Wednesday night @ 7:00 pm in room 101 of the HS. The agenda items include an update on the building progress, update on board candidates, setting the dates for summer school, Approval of policy updates, approval of the JH football cooperative, discussion of Track and Field, discussion of staffing. Executive session will be held immediately following the regular meeting. Tonight's 3rd place game in Appleton City has been cancelled. We will keep you posted on when the game will be rescheduled. Enjoy you weekend a be safe. Reminder Friday, December 21, 2018 is a half day school will dismiss at 12:07, students will not return until January 3, 2019, Have a Happy Holiday and a Happy New Year. Brick work is wrapping up! The warmer weather has allowed the Brickwork to start! #CHSIndianNation: Tomorrow's home game vs. Otterville will tip-off with 2 quarters of JV boys at 5:30pm. Varsity Girls and then Varsity Boys will follow. Hope to see you at the games! Temporary hallway/doors are available for student use in the building. Board Candidate Filing Window Opened today: the office will be open until 5:00 pm today 12/11 and will be open during regular business hours when school is in-session until January 15, 2019. There are two seats up for election in April, 2019. 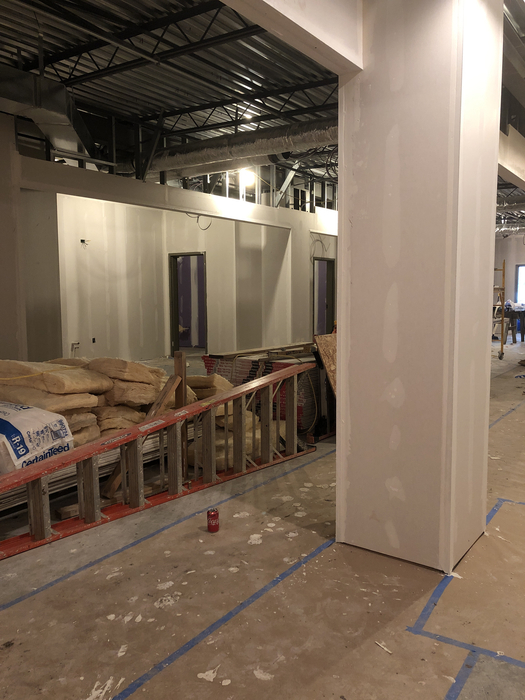 Internal walls are getting drywall! Please join us tomorrow evening (Dec. 6th) for our Winter Program, Book Fair, and PTO Hot Cocoa and Cookies! Winter Program begins at 6:30. The Book Fair is open from 4:00 p.m. to 8:00 p.m. PTO Hot Cocoa and Cookies following the program. Hope to see you there! The boys basketball team will play in the Tiger Classic basketball tournament in Kingsville tonight, Tuesday, December 4th. They will face the Lone Jack, JV at 6 PM and the bus will depart at 4:30 PM. The Book Fair is here! Shop from Thursday (Nov 29) until 2:00 pm next Thursday (Dec 6) in the art room. On Thursday, the night of the Winter Program, shop in the Kindergarten room from 4:00 pm to 8:00 pm (or later if needed). The fair will be closed during the concert. 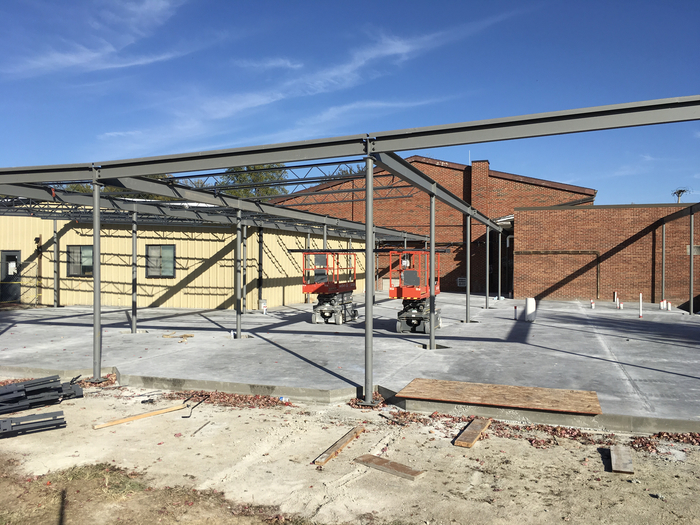 The temporary doors are in for the cafeteria. Please join us next Thursday, December 6th for the Winter Program at Chilhowee School. The program will start at 6:30pm in the gym. due to the inclement weather, school is cancelled for Monday 11/26. The roof is done and the work continues on the inside. Reminder tonight's Fall Sports Banquet will be held at 6:30 PM. This year it will be held in the cafeteria. 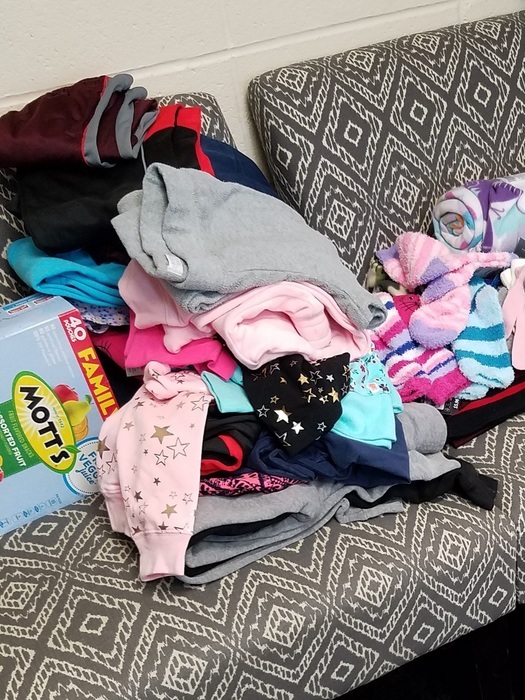 It is that time of the year, that the lost and found has been cleaned out. The students will have until Thanksgiving break to claim their items. After the break leftover items will be taken and donated to a charity. Booster Club Meeting, Monday, November 19 at 7pm in the school cafeteria. 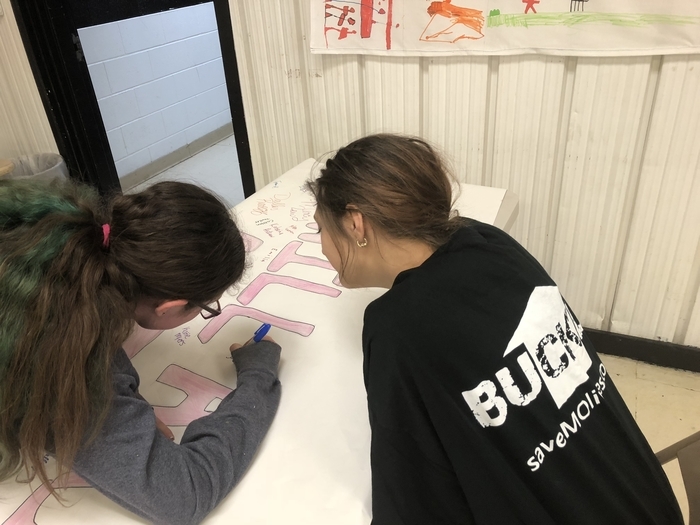 Topics to be discussed include construction of the concession stand and future fundraising, some new officers will also be elected. If you are interested in being a Booster Club member or an officer, please attend this meeting. Everyone is welcome to attend. Varsity Boys will have practice tonight 3:30-5 PM and Varsity Girls will practice from 8-9:30 PM tonight Tuesday November 13th. 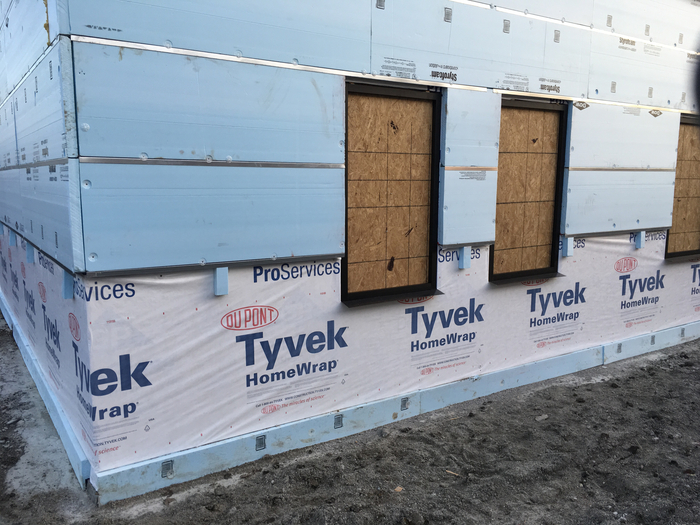 The interior walls are getting completed during the snow and cold. The Career center classes have been cancelled this afternoon Nov 12th. Science Club for this afternoon has been canceled and rescheduled for next Wednesday, November 14th. 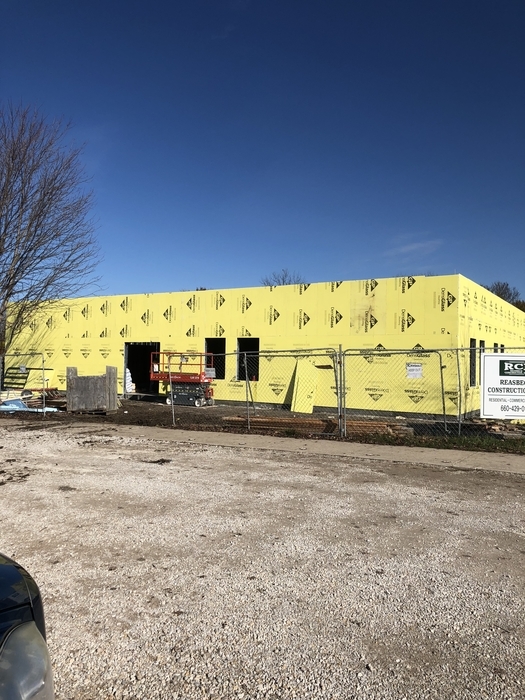 The exterior walls are finished and the roof is getting started. The roof panels are installed. National Honor Society will be hosting the Red Cross Blood Drive on November 2nd, 2018 form 2-6 PM at the Chilhowee School. We are collecting box tops from October 29th - November 2nd. Please ask your child about the contest going on! 7th-12th grade teachers will be available for open conferences on Wednesday, Oct. 24th from 3-6 and Thursday, Oct. 25th from 1-6. If you would like to request a specific time please call the school office to set up an appointment. Don’t forget to come to Football Senior Night tonight! Kickoff is at 7:00. The Junior High NHS Induction Ceremony is rescheduled for Tuesday, November 13th at 6pm. This reschedule is due to the Junior High Basketball Team being scheduled to play a conference tournament game on the original date of the Induction Ceremony. Thank you for your support! Reminder there is No School Friday October 19th, there is also a half day on Thursday October 25 for parent teacher conferences and No School on Friday October 26th for parent teacher conferences. The posts and beams have started! This year's Mid-State Volleyball Conference Tournament will be played here at Chilhowee High School. Please support the Lady Indians on Thursday, October 18th and Saturday, October 20th! #CHSIndianNation; Join us tonight for Volleyball Senior Night, Tri-Meet vs. Calhoun & Orrick starts at 5:30pm. 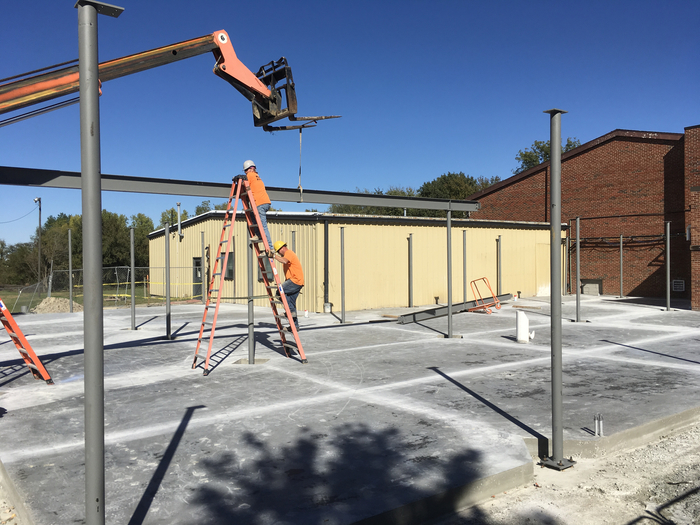 concrete is poured. The pad is set. High school football team pictures will be taken this Friday at 5:30 pm before the game. This includes all freshman players. 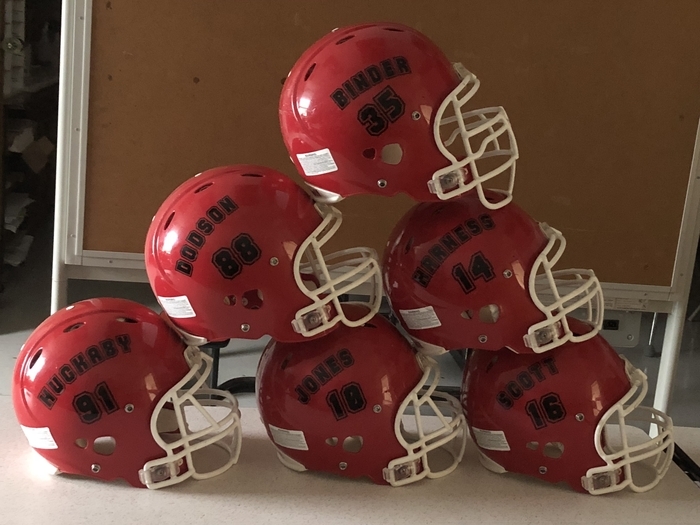 Reminder: Mother/son football pictures will also be taken at 5:30 pm on Friday. Mothers are to wear jeans and their son's white jersey or a plain white t-shirt. If you have any questions, please contact Sandi Anstine at 816-726-2044 or see the post on the Indian Athletic facebook page. 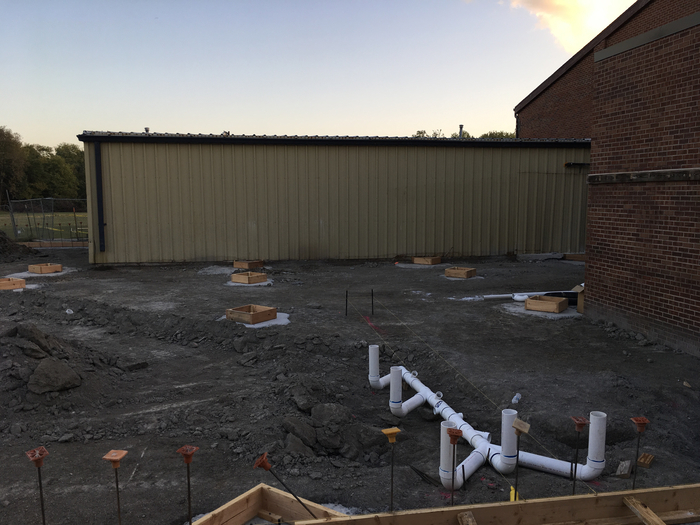 The plumbing is going in, things are moving forward. Homecoming is next week! 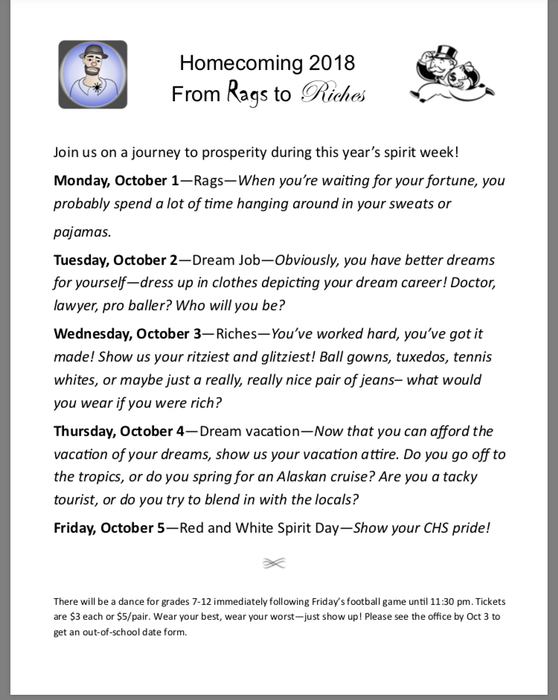 See the attached image for spirit days. 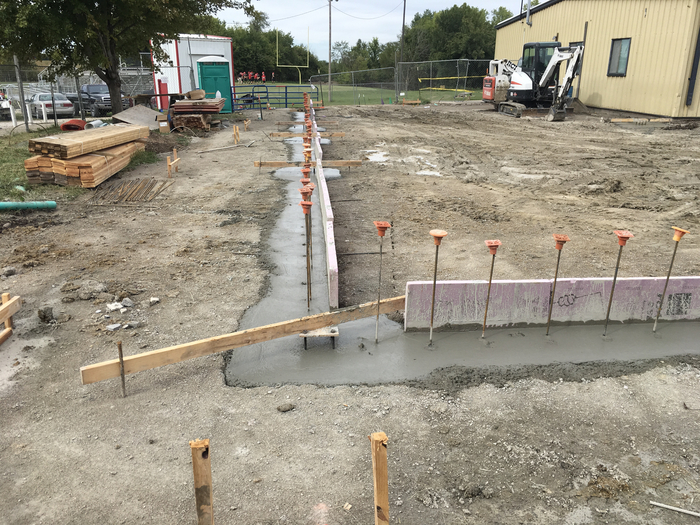 The footings were poured today. 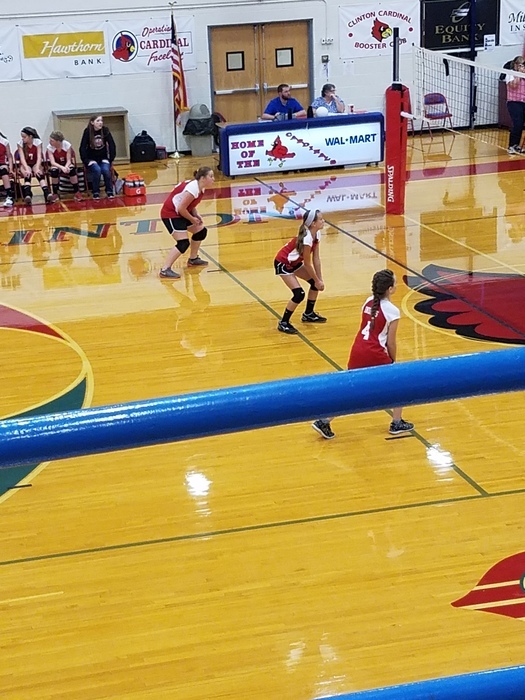 The Junior High Volleyball travels to JCCA to take on the Eagles tonight Thursday September 20th at 6 pm. 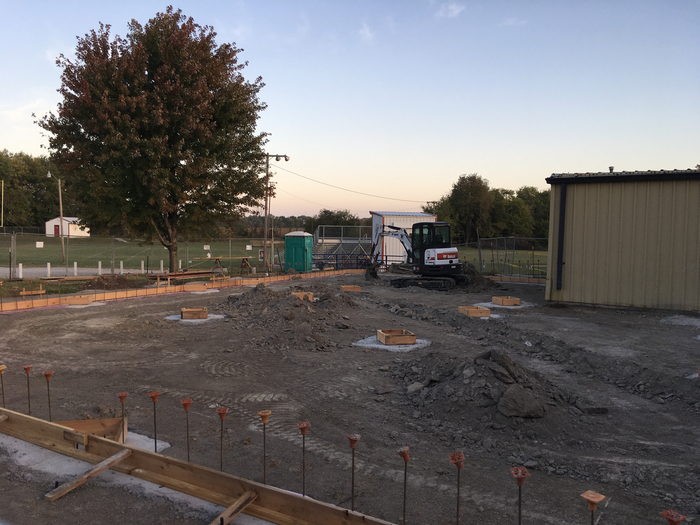 gravel is in, and the forms are being set for the footings! The Chilhowee R-IV Board of Education will meet on Wednesday night 9/19/2018 @ 7:00 pm in Room 101. Items on the agenda include: update on building progress, testing dates, Budget update, and Policy updates. With the Dry weather, they are back working! Some very nice plays by our junior high volleyball girls at their first game of the season. #CHSIndianNation: Lady Indians' Varsity Volleyball travels to Calhoun to take on the Eagles tonight at 5:30. 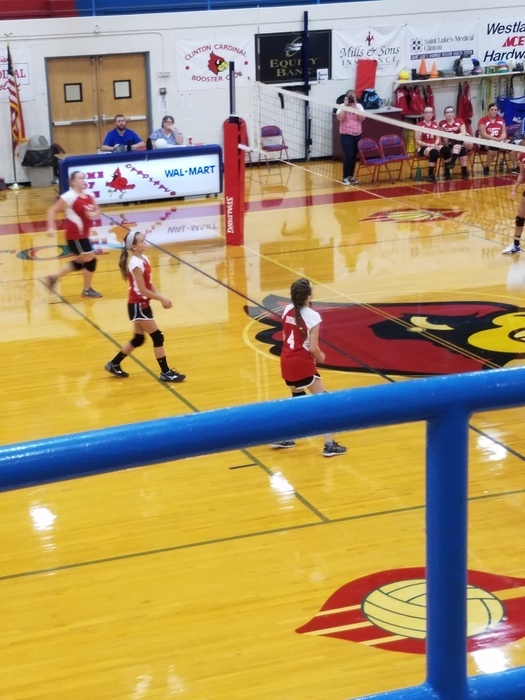 #CHSIndianNation, Lady Indians' Junior High Volleyball travels to Clinton Middle School to take on the Lady Cardinals on Thursday, Sept. 13th at 5pm. Indians' Football kickoffs the home opener tonight at 7pm! Grandparents' Day is today at Chilhowee School! We hope to see all of our elementary students' grandparents today from 1:30pm to 3:00pm! The Tax Rate hearing is Wednesday night at 7:00 pm in Room 101 of the school. The public hearing is to discuss the proposed tax rate of the district. The regular meeting will follow the hearing. The Regular Board of Education Meeting is tonight Wednesday 15th @ 7:00 pm in Room 101. Items on the Agenda: old business building update, new business setting tax rate, set tuition rate, approve annual secretary of board report, assign program coordinators, approve local compliance plan, Board Policy Resolution, policy BBFA conflict of interest. The new whiteboards and projectors are up in the classrooms. Please join us for the Chilhowee Back to School Bash from 4:30 to 6:30 on Monday, August 13. There will be a Title I meeting at 6:15pm and an Athletics Informational Meeting for Players, Parents, and Fans starting at 6:30pm. 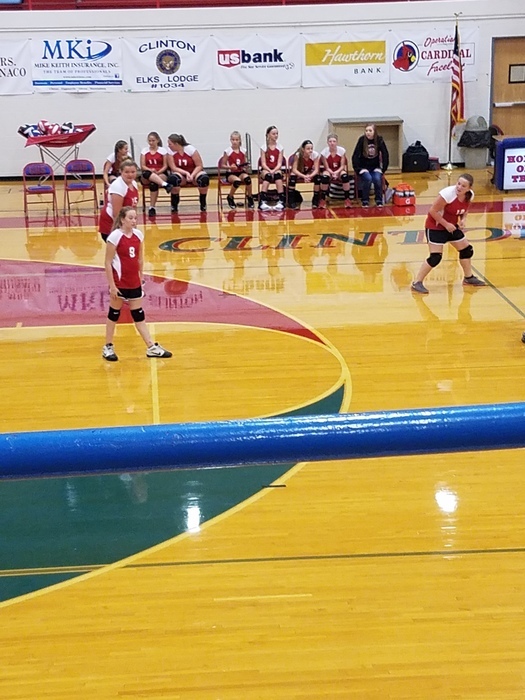 Chilhowee Junior High Volleyball Practice will Start on Monday, August 13 from 4:00-5:30. Chilhowee cheer begins on Monday, August 13th! Practice will run from 7:00 to 7:45 in the morning. You will receive an August practice schedule and additional information at the first practice. Again, set your alarms, this will be a morning practice starting at 7:00am. The doors are up and final coat of paint is being applied. Getting closer to the start of school. Breezeway walls are coming down. The offices have traded places. The Principal office and attendance window are now at the entrance. pad site is almost level, next step is gravel. The last tiles are being installed. One step closer to the getting the new rooms. They are filling in the pad site to be ready for the next stages. The pad site is ready to be filled for the new building. The old building basement has been removed. 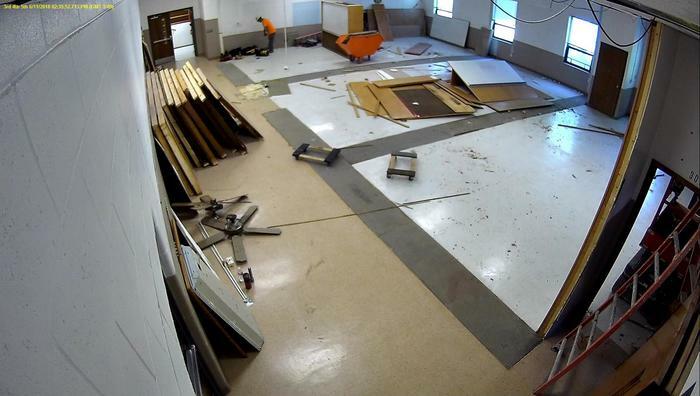 the old locker room walls are being removed. Excavation has started on the new addition. Primer on the walls getting ready for Tile removal. 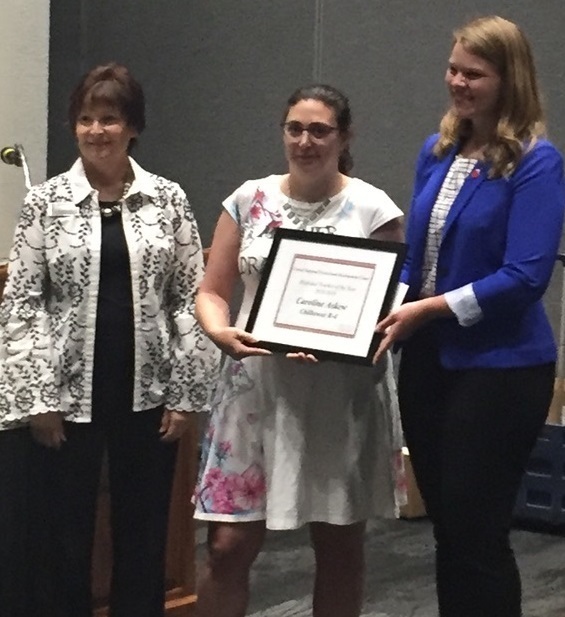 Mrs. Askew receives her award as one of the two regional teacher of the year finalists. Trailer is gone, ready for ground work. 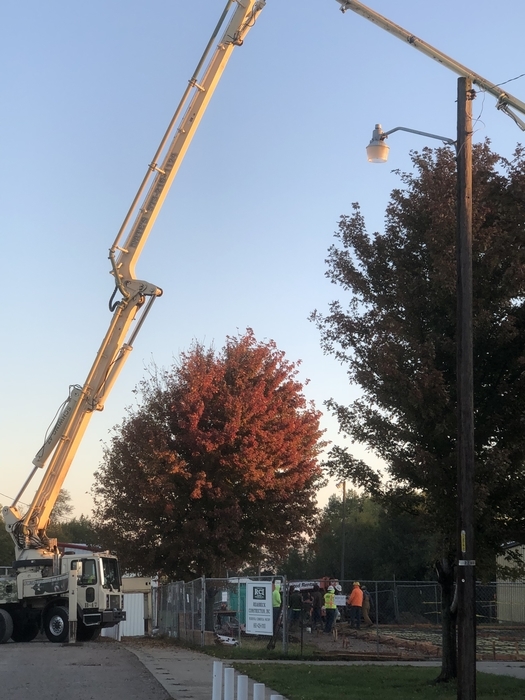 Breeze way work has started. The end of an era for the Chilhowee School. Walls are going up in the Elementary renovation. Open gym for 7-12 graders volleyball players, July 10 and July 12, 1:00-2:30. Volleyball camp for 4-12 graders, July 16-19, 8:00-11:30.
elementary walls are coming down opening up space. The Lady Indians Basketball Team will begin open gyms on Monday June 4th from 4-6pm. Summer Open Gyms will occur on Monday, Wednesday, & Thursday from 4-6pm. 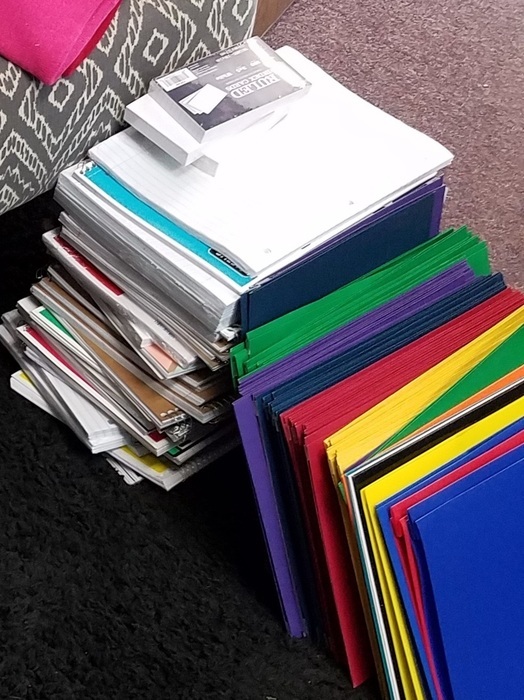 School to Work: Any senior that is planning on participating in the school to work program needs to have their paperwork to Mrs. Dillon by May 24th. Summer School will be held June 4th-June 29th, 2018. A free breakfast and lunch will be served daily to all children 18 and under. Breakfast will be from 7:30-8:00 and Lunch will be from 11:30-12:00. There is a public forum on Tuesday Night May 22, 2018 @ 6:00pm to discuss the new building and the renovation/realignment at the elementary. Regular Board of Education meeting is scheduled for Wednesday night 7:00 pm in the Library. Items on the agenda include Old Business: discussion of the building improvement project. New Business: 1. Bid approval for Building Project 2. Surplus Property (modular unit), 3. Freezer Bids, 4. Worksite Learning, 5. JH volleyball, and 6. MSBA conference. Executive session will be held after the regular meeting. 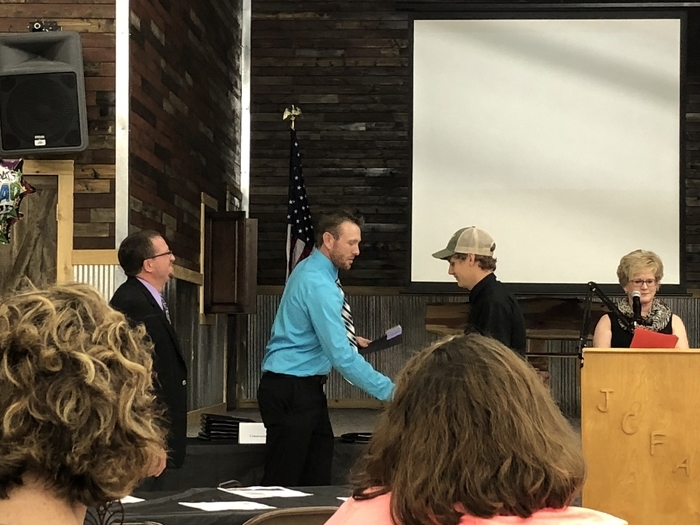 Congratulations to our Warrensburg Area Career Center graduates! 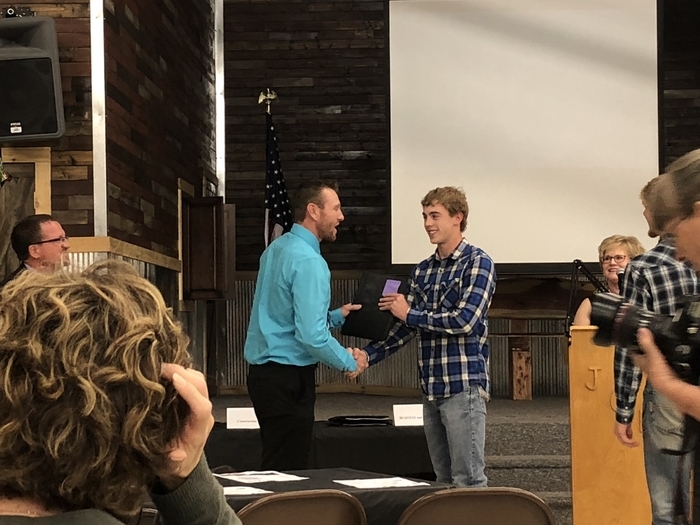 Seniors Dalton Anstine, Alex Schumacher, and Christian Terry received certificates tonight. The Annual PTO School Carnival is TONIGHT from 5 to 8pm! 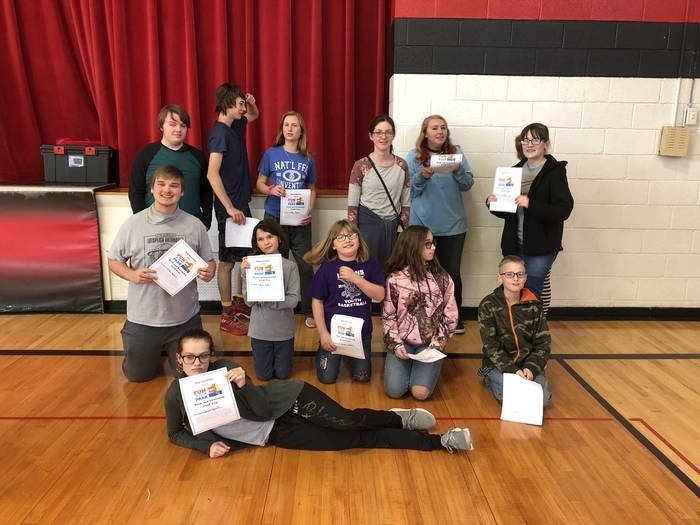 Chilhowee School will be holding summer school June 4th-29th and there is still time to sign up! Pick up a sign up sheet from the school office or request your child bring one home. Due May 11th! 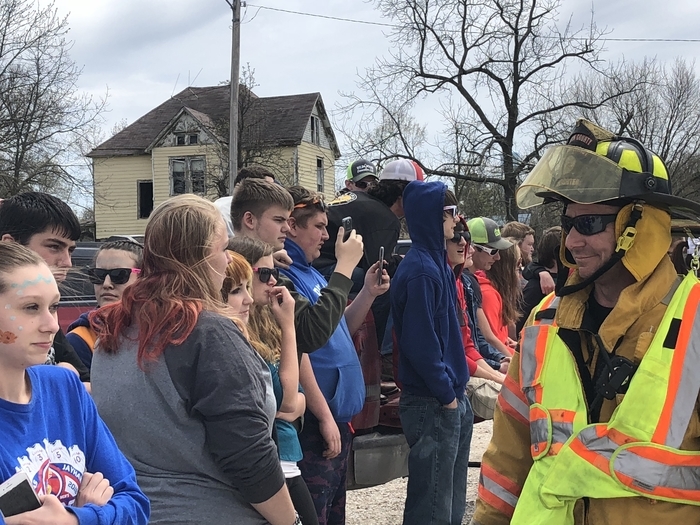 A huge thank you to the Johnson County Fire Department Station 3, the Johnson County Ambulance District, the Johnson County Sheriff’s Department, the Missouri Highway Patrol, Eagle 5 Life Flight, Warrensburg’s Daily Star Journal, and the Chilhowee Student Leadership Team for their help with Arrive Alive/Safe and Sober today. 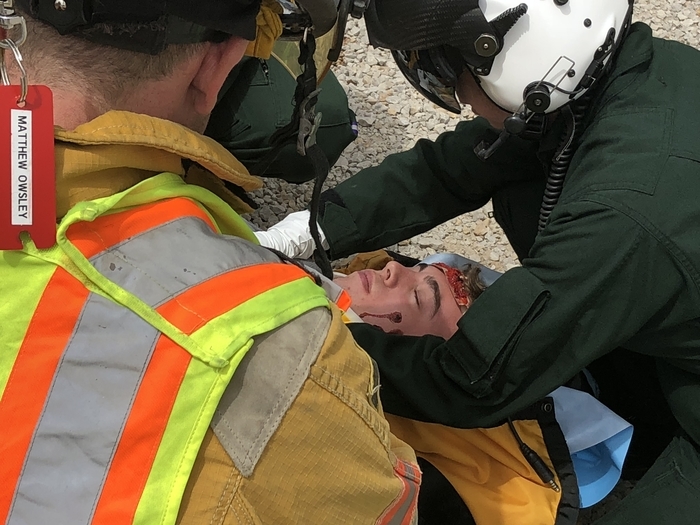 Several seniors helped stage today’s mock accident to illustrate the dangers of texting and driving. With the MAP and EOC testing going on in the building. All Visitors who come to the school will need to check-in and stay in the school office. Thanks! 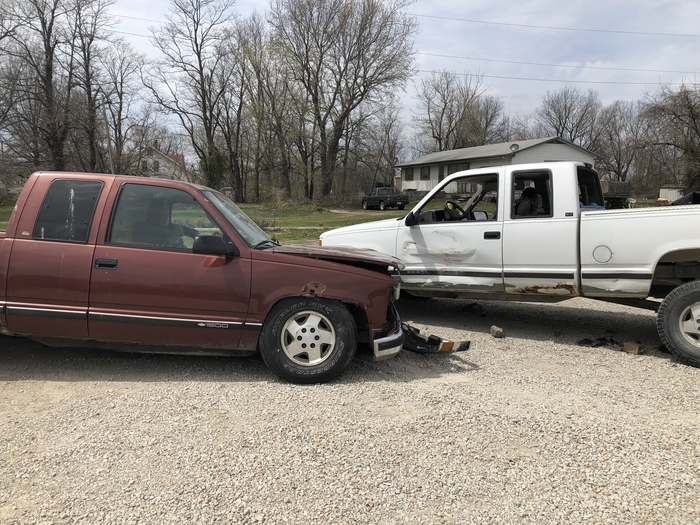 Tomorrow, April 20th, there will be a mock accident in the school parking lot as part of our Arrive Alive/Safe and Sober presentation for high school students. 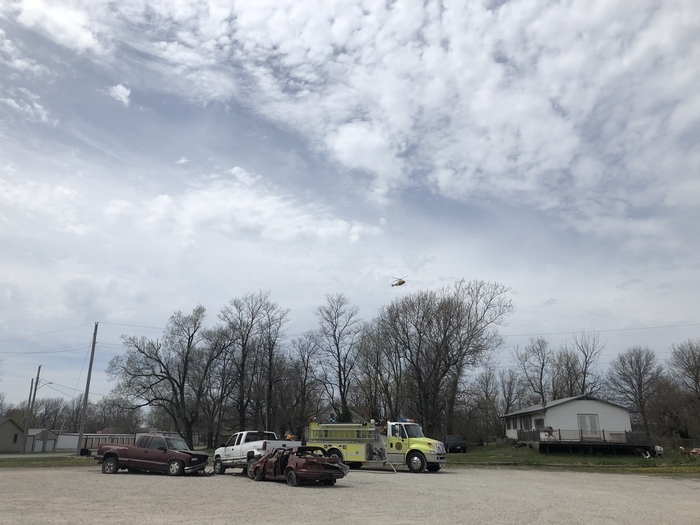 Fire trucks, an ambulance, and life flight will be part of this presentation. Students in 5th, 7th, and 8th grades will be taking the MAP tomorrow, April 17th. Students who are MAP or EOC testing will receive a free breakfast on the days that they test. 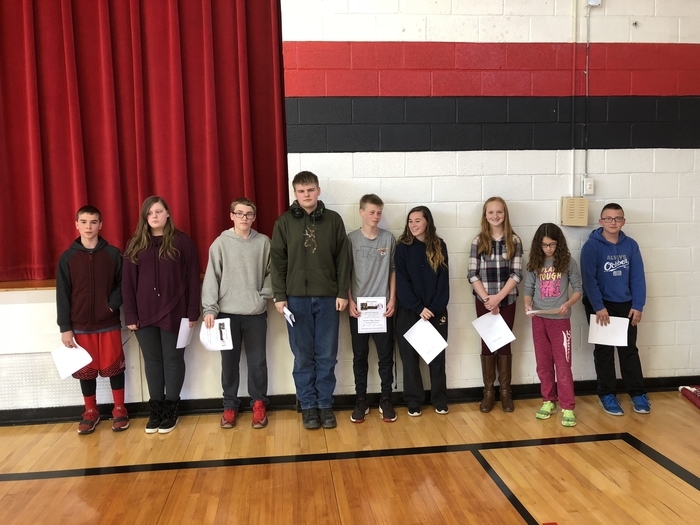 Several students received rewards today for last year’s performance on State assessments. 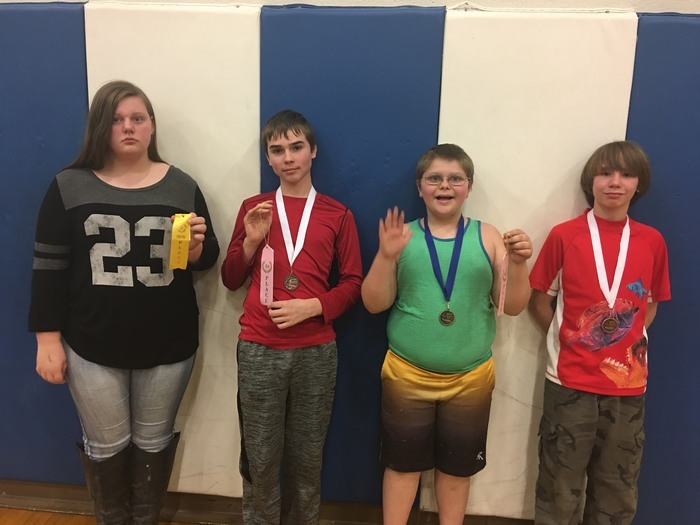 Prizes varied from afternoon parties to trips to Worlds of Fun for the highest levels of achievement. Tomorrow morning we will be beginning testing for grades 3rd-8th and high school EOC assessments. Testing will occur Tuesday-Friday from now until May 4th. Please make sure your child is present at school during testing, has a good night's sleep, and eats breakfast. Please call Mrs. Dillon if you have any questions. Mrs. Askew’s STEM class is exploring different technologies. 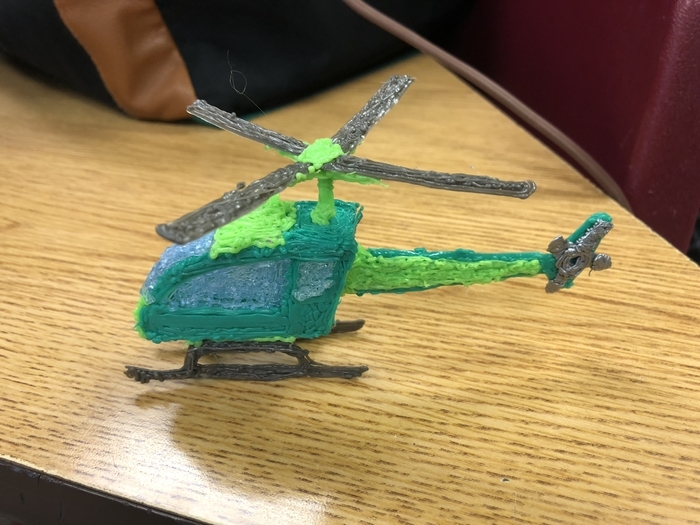 Today, a student used a 3D pen to create this helicopter. The PTO carnival has been set for Saturday April 28th from 5-8pm. There will be walking tacos for food, bingo, a silent auction, and other games. Please come by the school and support the PTO. Don't forget about the NHS Red Cross Blood Drive from 12:30-6:30 PM today, Friday April 13th. If we receive 26 viable pints of blood donated, we can offer a scholarship to one of our seniors. Tomorrow, April 6, is the last day to shop this year’s BOGO book fair. The fair will close at 3:30pm. ACT Test for Juniors will be held on April 10th in the computer lab beginning at 8:30 a.m Parents of juniors please encourage them to get a good night's sleep, eat breakfast, and be on time. The monthly board meeting is scheduled for Wednesday night March 21st @ 7:00 pm in the library. Items on the agenda include Old business: Building update, 2018-2019 school calendar, CSIP plan. New business includes: Certified salary schedule, certified salaries, and Setting date for the Board reorganization. Closed executive session will be held based on Mo. Revised Statute 610.021 (3) and (6). 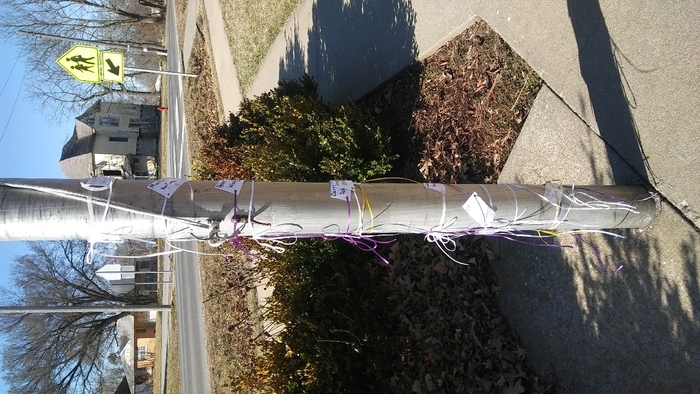 Led by the Student Leadership Team, Chilhowee students tied ribbons to the flagpole representing victims in Parkland, Florida, followed by a moment of silence for each one. 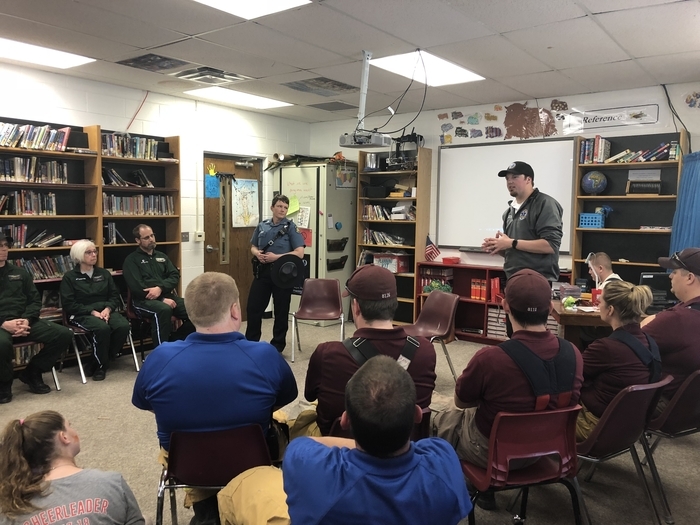 Senior Zach Toole challenged students to live a "walk up life" and walk up to those in need and try to make their lives better. 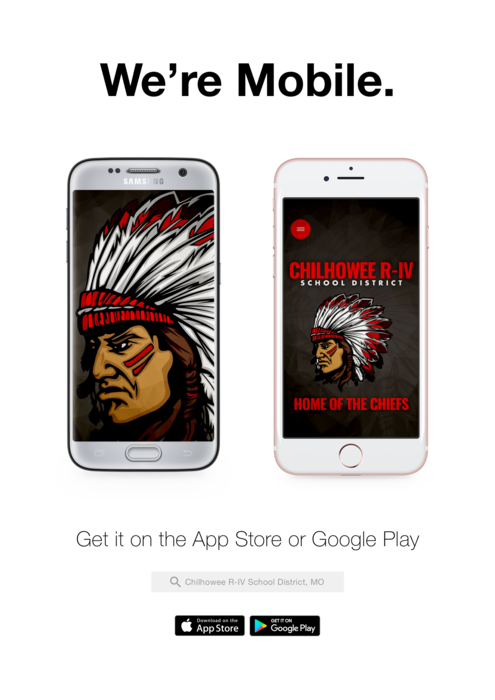 Chilhowee School District is going Mobile! Be ready in the coming days for the access information. Due to the icy conditions school will not be in session today Thursday 2/22. If the district basketball schedule changes updates will be sent out. Due to the weather school will release at 12:00 on tuesday 2/20. due to the light freezing rain, the FFA bowling and tutoring have been cancelled for tonight. The Box Top Contest is starting in February. Thanks Jasen Jennings for helping find the leak and get the water shut off! Thanks to the volunteers who helped clean the classrooms yesterday! Keri Smith, Misty Miller, Teresa Lowe, Jessica Lankford and thanks to Henry Tate for all the help. Science Club for Tomorrow Afternoon is cancelled (Thursday 1/18). Prior to the Board meeting there will be a Public meeting to review and discuss the CSIP plan of the district. The meeting starts at 6:00 pm in the Library. Regular board meeting scheduled for January 17th @ 7:00 pm.